World GDP almost doubled from 2000 to 2008, from $32 trillion to $61 trillion (according to the World Bank, World Development Indicators). Australia's GDP growth was much faster than Argentina, and Argentina's growth was much faster than Chile, which has a GDP of $170 billion (about half the size of Walmart's annual revenues). Most are simply ignorant of the enormous value the Bush Administration, Wall Street, and Corporate America added to the U.S. and global economies. It was the "Invisible Hand" at its best. The Bush Administration inherited the worst stock market crash, since the Great Depression, and a recession. However, the Administration turned the recession into one of the mildest in history, after the record economic expansion. Over a five-year period in the 2000s, U.S. corporations had a record 20 consecutive quarters of double-digit earnings growth, two million houses a year were built, 16 million autos per year were sold, U.S. real GDP expanded 3 1/2% annually, in spite of 6% annual current account deficits (which subtract from GDP). The Bush Administration was adept minimizing the recession in 2008, until Lehman failed in Sep '08, which caused the economy to fall off a cliff. However, subsequent appropriate policy adjustments were implemented quickly. Wall Street facilitated the building of the most efficient economy the world has ever seen, created and captured trillions of dollars of real wealth in the global economy, distributed that wealth to America's masses, and diversified the risk globally. Corporate America offshored high cost, heavy goods, or goods with declining prices for big profits, imported those goods at lower prices, and shifted limited resources into emerging industries and into high-quality "core goods" of older industries with market power. Peak, wasn't a good deal of the GDP growth in the US from 2000-2008 created on borrowed money? I don't recall that being considered a good thing. It's possible, of course, that I slept through the lecture on "The Invisible Hand Goes A-borrowing". I also seem to recall that a large portion of that GDP growth was due to government spending, which almost never improves my standard of living. Maybe GDP growth isn't the best indicator of economic health. Would you have preferred higher prices and interest rates. So, fewer Americans could afford to borrow? Yes, living standards rose sharply along with government spending, although the budget deficit shrunk to $162 billion in 2007, while the economy expanded. In a word, yes. We as consumers and we as a country now owe more than we can ever hope to pay back without serious pain. How is that a good thing? There are no good paths forward from here. "The Bush Administration inherited the worst stock market crash, since the Great Depression, and a recession. However, the Administration turned the recession into one of the mildest in history, after the record economic expansion." I love revisionism. Yes, Bush inherited a bubble that had just been popped after a long period of liquidity injections by the Fed. But he chose to 'fix' the problem by pushing for an even bigger bubble that burst as he was leaving office. He was a pro-government borrow and spend statist who pretended to be a conservative at a time when the United States needed a leader with the strength and conviction to let the markets liquidate malinvestments. "Over a five-year period in the 2000s, U.S. corporations had a record 20 consecutive quarters of double-digit earnings growth, two million houses a year were built, 16 million autos per year were sold, U.S. real GDP expanded 3 1/2% annually, in spite of 6% annual current account deficits (which subtract from GDP)." The reported profits were created by a massive injection of liquidity that weakened the USD and by accounting tricks. Now we see that the financial system is technically insolvent and that the earnings were an illusion. "The U.S. economy was most efficient, while Americans stocked-up on real assets and goods, and capital was built-up. It was one of the greatest periods of U.S. prosperity, and in a structural bear market that began in 2000." This is a stretch. The US economy was based on financial gambling and speculation that depended on loose FASB rules, a compliant SEC, and an ever growing money supply. That was not sustainable and ended in disaster. "The Bush Administration was adept minimizing the recession in 2008, until Lehman failed in Sep '08, which caused the economy to fall off a cliff. However, subsequent appropriate policy adjustments were implemented quickly." You can't spin this. The US financial system was bankrupt and still is. The economy, which depended on a growing money supply cracked and is still in serious need of repair. Bush and Bernanke deserve the blame because they ignored the warnings of people like Ron Paul and could not muster the courage to look over the horizon. "Wall Street facilitated the building of the most efficient economy the world has ever seen, created and captured trillions of dollars of real wealth in the global economy, distributed that wealth to America's masses, and diversified the risk globally." Wall Street used accounting tricks to transfer wealth from savers and investors to financial insiders. It is now insolvent and can't survive without government intervention. "Corporate America offshored high cost, heavy goods, or goods with declining prices for big profits, imported those goods at lower prices, and shifted limited resources into emerging industries and into high-quality "core goods" of older industries with market power." No. Good companies got tired of the scams and moved their operations to areas that taxed less and protected property rights more than the US does. This is why the US is in decline. VangelV, assets, goods, and capital are much more than paper, and they were more abundant in the 2000s than ever before, which improved U.S. living standards much greater than real GDP growth. There's a difference between absolute value and relative value. I could show you a house and say it's worth $500,000 and you may agree. I could show you the exact house tomorrow and say it's worth $100,000 and you may say it's a bargain. The paper economy you're talking about represents relative value. It has nothing to do with absolute value. A bar of gold doesn't improve when its price increases. In the 2000s, the U.S. economy had tremendous improvements in real value, which I explained above, although relative values change. "The paper economy you're talking about represents relative value. It has nothing to do with absolute value. A bar of gold doesn't improve when its price increases." There is no such thing as absolute value. In unhampered markets value is always subjective. "In the 2000s, the U.S. economy had tremendous improvements in real value, which I explained above, although relative values change." See the statement above. You need to go back to the drawing board and reject the notion of objective value. "VangelV, assets, goods, and capital are much more than paper,..."
"...and they were more abundant in the 2000s than ever before, which improved U.S. living standards much greater than real GDP growth." Again correct. But there is something that you are ignoring. While US production is higher than it was a decade ago and the standard of living has been improving, there is clearly an increase in the debt accumulated by Americans and their governments. The American experience is not sustainable because the currency is not viable. This means that there is a need for a major correction that will clear old debts and allow the economy to recover in a sustainable manner. But I do not see either the Republicans or Democrats having the courage to do what they must. Both parties, and their supporters, prefer to keep the game going just a little longer and to blow the bubble just a bit larger. Inevitably that leads to failure and you will see the US follow the path taken previously by Mexico, Argentina, Greece, Hungary, Yugoslavia, etc. The government should've done something constructive, e.g. 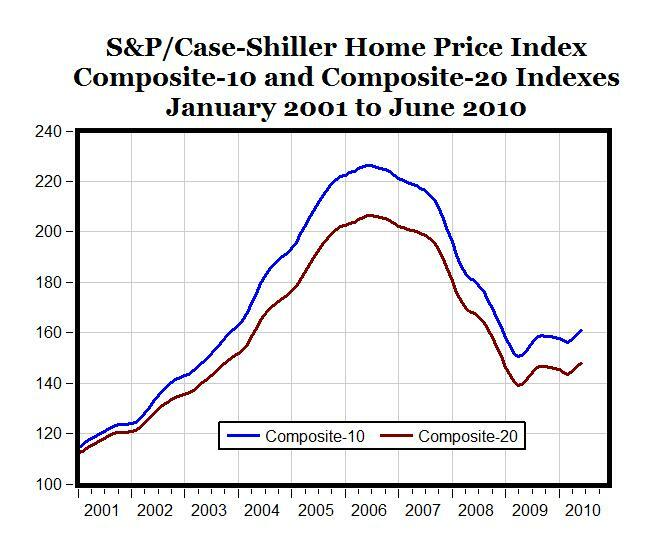 put a floor on home prices (perhaps 90% of 2005 market values). That way good homeowners wouldn't have to become good renters. If the U.S. economy has the capacity to build 2 million houses a year, why are we building 300,000 a year? I doubt laid-off construction workers will become microbiologists or biochemists anytime soon, and entreprenuers aren't creating enough jobs for the millions of people laid-off in housing-related jobs. Why is a 70% homeownership rate too high, and why can't many more Americans own two or three houses? Are we better off with idle resources for several years or a decade? place a floor on home prices? are you channeling seth? what happens when you overprice a product? if you want to boost home ownership, you need new buyers. fixing prices at high levels would drop home ownership. first time buyers would find them out of reach. can you seriously be arguing that fixing prices at high levels will increase home ownership? would fixing the price of cars at high levels increase auto ownership? even if we assumed for a minute that a price floor was a good idea, how would you do it? the government can't buy up all the surplus houses. that's too expensive and doesn't solve the problem. you'd just rent from them and not the bank. so what, pass a law dictating for what you can sell a house? that's unconstitutional. FDR's 1933 recovery act got shot down for trying just that sort of thing. Morganovich, bank deposits are insured up to $250,000. Why not home price insurance also? If your house is sold below 90% of its value, the government, for example, can send you a check for the difference. Houses are typically a slow appreciating asset, not a steep depreciating asset, like autos. Anyway, the point is to refund money to households, promote economic growth, and maintain the homeownership rate. "If your house is sold below 90% of its value, the government, for example, can send you a check for the difference." Peak, this has to be one of the worst ideas I've ever heard of. Please don't ask for MORE government interference in the housing market. They've done enough damage already. Besides, the government is broke, remember? What you are suggesting would let house prices drop like stones, as no one would have any incentive to ask for as much as they could get. any low price would be OK, as taxpayers would make up the difference. The number of ways to abuse such a system is mind boggling. How would I calculate the "value" of my home, considering that all value is subjective? Is it the comp price in 2006? The price I paid in 1991? Just what? Ron, there are good, bad, and roughly neutral government policies. We've seen many bad government policies over the past two years, which left the American people broke, unemployed, homeless, and with a huge bill. A few simple rules can minimize fraud, e.g. 10 bids through three mortgage firms, with the highest bid getting the house, a waiting period of five years to resell a house (to collect insurance), etc. There are people today, who are buying houses at half off or very cheap (homeowners and banks lose), fixing them up, and selling them for profits. If your house was worth $500,000 in 2005 (e.g. appraised value) and you sell it at $400,000, the government can send you a check for $50,000. Then 90% of $400,000 is insured. It could be a temporary policy, e.g. for 10 years, to stabilize housing prices. Or the $50,000 could be in the form of a voucher, for a down payment on another house. bank deposits are cash. that's not that same as a physical asset. you are arguing that higher prices will increase demand. who would provide this magic asset guarantee? how about we guarantee that stocks can never go down too? that way we'll all have plenty of money to retire. "We've seen many bad government policies over the past two years, which left the American people broke, unemployed, homeless, and with a huge bill." Let's focus on eliminating those bad policies to help prevent problems in the future. Let's not add more interference from government. "A few simple rules can minimize fraud, e.g. 10 bids through three mortgage firms, with the highest bid getting the house, a waiting period of five years to resell a house (to collect insurance), etc." What if I only get 2 bids? Who will administer this? More government bureaucracy? No thanks. "There are people today, who are buying houses at half off or very cheap (homeowners and banks lose), fixing them up, and selling them for profits." Peak, I think that's called free enterprise. I, for one, am in favor of it. "If your house was worth $500,000 in 2005 (e.g. appraised value)..."
My house wasn't appraised in 2005, and there were few comp sales in the neighborhood. My friend the appraiser would probably boost this to $600k if I bought his lunch. More room for abuse. Any guess at it's value in 2005 is highly subjective. There is no absolute value for houses. "...and you sell it at $400,000, the government can send you a check for $50,000. Then 90% of $400,000 is insured." I think you mean 90% of $500k. Some of that $50k is YOUR money, you know. You don't have a problem helping someone pay for my house? "It could be a temporary policy, e.g. for 10 years, to stabilize housing prices." Peak, you KNOW how those 'temporary' policies work. Why is it government's job to stabilize housing prices? How about stock prices? Should government try to stabilize those also? Personally, I don't want money taken out of my pocket to help people who made bad choices. I'm not sure why you think it's OK to spend taxpayer money on something like this. Our goal should be LESS government, not more. Ron, you got your "free enterprise" result. Millions of Americans lost their homes and jobs. So, we're now building 300,000 houses a year instead of 2 million. Afterall, Americans spent and borrowed "too much," because prices and interest rates were "too low." The government shouldn't prop-up the economy. We should've washed out everyone except the strongest households and started over. Housing doesn't need price insurance like the stock market doesn't need put options or stop losses. "Ron, you got your "free enterprise" result. Millions of Americans lost their homes and jobs. So, we're now building 300,000 houses a year instead of 2 million. Afterall, Americans spent and borrowed "too much," because prices and interest rates were "too low."" What "free enterprise?" The US government was pushing home ownership and forcing banks to lend money to people who could not afford to own homes. The government protected ratings agency oligopoly was giving AAA ratings to junk paper. The highly regulated banks were permitted to play games by using mark to fantasy accounting tricks. The mortgage market was dominated by the GSEs. The Fed was pumping liquidity into the system to promote the housing bubble. There clearly was no free market and you know it. "The government shouldn't prop-up the economy. We should've washed out everyone except the strongest households and started over. Housing doesn't need price insurance like the stock market doesn't need put options or stop losses." This is sensible. The government should not interfere with any markets. If it stayed out of the way bubbles would be local, much smaller, and would not threaten the entire real economy. VangelV, the free enterprise to look for a job and when you can't find one buy cheap houses, fix them up, and sell them. Anyway, sounds like a bunch of elitist talk: Americans consume and borrow too much, good renters make bad homeowners, it's sensible to wash-out everyone except the strongest households, turn a recession into a depression, etc. And I'm sure some want to continue blaming Bush, Wall Street, and corporate greed. "There was no government involvement required to precipitate the Dutch tulip-bulb frenzy of the 1620s, or the tech-stock boom of the 1990s. Ponzi schemes require no implied government guarantee. Yet a lot of people seem to be seeking for a way to claim that government distortion of the real-estate market played a key role in this crisis, even though the evidence shows that what changed was not government, but financial markets." How exactly did inequality fuel the crisis? "Anyway, sounds like a bunch of elitist talk: Americans consume and borrow too much, good renters make bad homeowners, it's sensible to wash-out everyone except the strongest households, turn a recession into a depression, etc." There is nothing elitist about pointing out that people with no incomes and bad credit histories should not be allowed to buy $350K homes with no money down. "And I'm sure some want to continue blaming Bush, Wall Street, and corporate greed." Bush is as bad as Obama was. Wall Street uses regulators to protect itself from competition and the Treasury from having to manage risks properly. I don't like government much and want to see the markets work properly. Let the big banks fail and get acquired by the banks that chose prudence over reckless behaviour. If people can't pay their mortgages take their homes and sell them to those who have the money to buy them. Stop rewarding bad behaviour and irresponsible actions and let money flow to those that deserve it most. From the Economist: How exactly did inequality fuel the crisis?" The commentary in the Economist is not very good. It ignores the fact that the securitization process was created to offload the risk of holding subprime mortgages onto others. Once that process was in place it opened up the game to unregulated lenders and got the GSEs to enter the game and make the bubble larger. My preference is for commentary that predicted that a problem would happen and identified the causes long before the bubble burst. "Yet a lot of people seem to be seeking for a way to claim that government distortion of the real-estate market played a key role in this crisis, even though the evidence shows that what changed was not government, but financial markets." Peak, if nothing else, perhaps you will agree that existing government distortions allowed financial market players to take actions they wouldn't have taken if all the risk had remained theirs, and that Fed action played a part through easy money policies. What do you think would have happened with no CRA, no Fannie or Freddie, no FED, no home mortgage interest deduction, no special treatment of capital gains, etc. Why does government have any interest in home ownership? You previously asked why 70% home ownership wasn't possible, and the answer should be obvious. It's just not 'sustainable' without government interference in the market. You also asked why 'we' are only building 300k houses/yr when 'we' have the capacity for 2 million. That answer should also be obvious. Everyone who can possibly buy a house has already done so. In fact, it appears that many people who CAN'T buy a house have done so. The market is completely saturated. There is now a massive inventory of unsold houses, and no one in their right mind would consider building more. The good news, not often reported, is that those who patiently saved and waited to buy a house can now do so at bargain prices. "The good news, not often reported, is that those who patiently saved and waited to buy a house can now do so at bargain prices." Don't be so sure. There is always the nuclear option of devaluing the purchasing power of the dollar. Obama and Bernanke may yet sacrifice savers in one last attempt to bail out the reckless. Unless the savings is in the form of gold and silver out of the reach of the US government the risks for savers looking to buy homes are still very high.